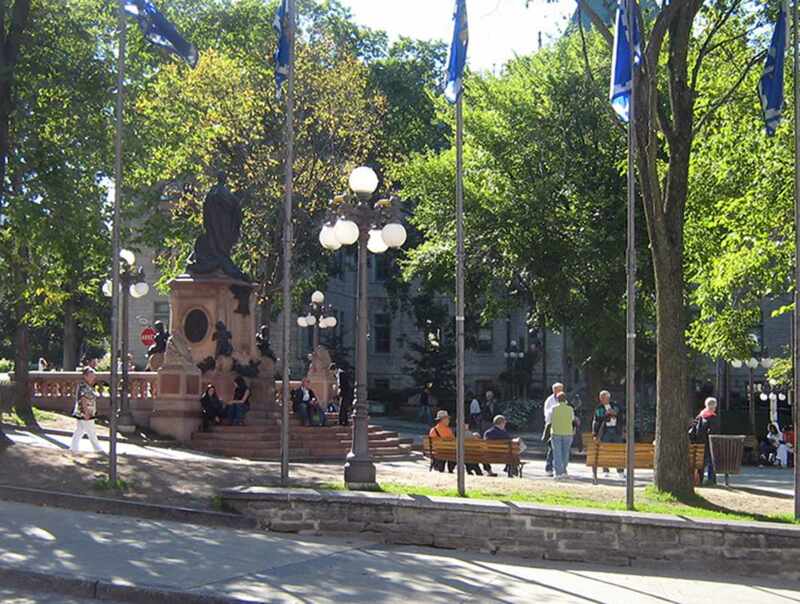 The public square across from city hall is called Place de l'Hôtel-de-ville and is bordered by three streets: rue De Buade, côte de la Fabrique and rue des Jardins. The public market in Upper Town had been held at this spot since the French Regime. Up until 1875, farmers from across the region would gather here to sell their wares. The public square was then known as Grande Place, Grande Place de la Haute Ville and Place du Marché. In 1900, the public square was renamed place de l'Hôtel-de-Ville following the construction of city hall, though it was also known as place Notre-Dame and place de la Basilique until the middle of the 20th century. The city hall of Québec, officially inaugurated in 1896, was built on the former site of the Jesuit college.